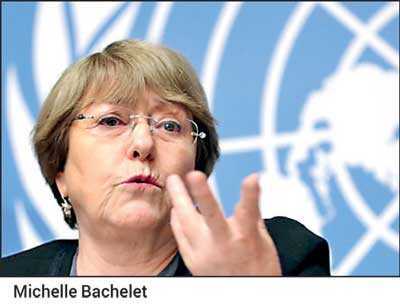 GENEVA, AFP: The UN human rights chief yesterday warned Sri Lanka it could slip back to conflict unless it addressed the “worst crimes” during the final stages of its ethnic war. Sri Lankan Government troops have been accused of killing at least 40,000 ethnic Tamil civilians in the final months of the island’s 37-year guerrilla war that ended in May 2009. Colombo had agreed to ensure an accountability mechanism by March, but Sri Lankan authorities have said they want another two years to deliver. The Council is expected to decide on granting an extension, but Bachelet said Sri Lanka’s failure to address emblematic cases had led to a lack of confidence. “Continuing impunity risks fuelling communal or interethnic violence, and instability,” she said. “Resolving these cases, and bringing the perpetrators of past crimes to justice, is necessary to restore the confidence of victims from all communities.” She noted a “lack of progress in setting up a special judicial mechanism to deal with the worst crimes committed during the 2009 conflict”.